Thanks for the vote of confidence Old School....I have talked with a lot of different drivers for Con-Way and haven't heard any complaints, I'm thinking I made the right choice. Well...It is official. I am now a Con-Way Truckload employee. Orientation was fairly painless, lots and lots of information to absorb in a short time but I have been told my finisher (Trainer) will be able to help with anything I didn't pick up in orientation. Road test and backing test was a little nerve racking but hey it wasn't bad. I got to drive a 2014 Intenational with the new Cummins motor...what a sweet ride. I am expecting to head out with my finisher some time this next week. Will keep you guys updated as much as possible. Everyone I have met at Con-Way so far has been great, very friendly, helpful and welcoming. Looking forward to getting going on my new career with a great company. Everyone be safe out there and I will look for you on the road! Depending on where you live the local workforce office can help. I just got my WIA approved through Weld County at the Greeley office...the also have schools in state that can get you on with the oilfield guys. It may all depend on why you are on probation though...if they can hire you or not. I finally heard back from the state on the WIA grant...I'm all good to go. Looks like I will be heading to Springfield to start school on the 13th of Jan. Got my background back from TSA already and I'm approved for my Haz-mat endorsement as well....Looks like things are finally moving along. I'm really looking forward to getting back in a truck and making some money. I have also went to my local library and got my card, they have well over a 4000 audiobooks and movies that you can download when you have wifi. The best part is it is free....just another suggestion for the down time. Here's a tip on how you can really do well on those state exams. Forget about that CDL manual and study the High Road Training Program Seriously, I aced all my tests this way without even cracking open that boring manual. Try it, you'll be so glad you took the high road! Old school is right...I did the high road training program as well and didn't even crack the state manual...only missed one question on the haz mat test...aced all the other ones! Good luck! I must be on a roll...just got back from my physical and got my 2 year card...YAY! Thanks for a great thread Daniel, good luck at Prime. See you out there somewhere! Stay safe! Thank you for your service...I looked into Crete for a couple of reasons. They don't make you drive as a team with your trainer...that makes sense since you can't learn anything from them in the bunk...(at least I hope not), they also seem to have very nice equipment and the drivers I talked to about them had nothing bad to say. 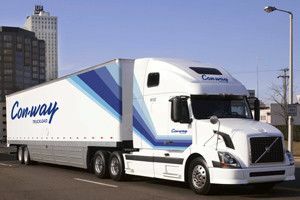 Unfortunately they don't hire in my area, so I'm headed to Con-Way truckload. Good luck and stay safe! This guy is at it again. Anyone need a laugh? That's pretty funny, I even thought about working for these guys since they have a mid west regional position that runs out of Denver....anyone have the real story about this company? First off I must say a big thanks to Brett once again....I went in to take the tests for my permit yesterday and passed all of them the first time. General knowledge, combination vehicle and air brakes...missed none! Haz-mat....missed one! The guy asked if I wanted to take doubles/triples and tanker too but I said I will pass for now. I can always take them when I go back to pickup my permit, the computers were down but I still passed! I also had an appointment with the state to see if I can qualify for a WIA grant to pay for school, looks like I am qualified but it takes a bit of time to get the paperwork through. The lady told me it may be 2-3 weeks before I find out anything....I was really hoping to start school right after Christmas but I may need to delay for a week or so. Will keep you guys updated as I move along toward getting back on the road. Thanks again Brett....The High Road Training Program works! I didn't even read my state manual! Thanks for the training program! I have finished going through the whole thing and have also downloaded the app for my droid. I like the fact that now while I'm sitting somewhere waiting for something I can go through a practice test. I'm getting excited since I go for my physical next week, take the test for my permit...then it is off to Missouri for school. Thanks again Brett for all the great info! Are there any truly Honest and good trucking companies out there in Northern Colorado currently hiring? Fran, I have a friend that drives for southwest mobile storage out of commerce city, he said they are looking for class A drivers right now. I would love to go to work for them but I don't start school till the 30 of December. He delivers all over Colorado and is home every night. Not sure what the pay is but he make a decent living and sees his family daily....let me know how the job search goes. Happy Thanksgiving to all, I hope most get home for dinner with the family. Stay safe and have a great holiday! I found the Rand McNally TND720 LM on Amazon.com for $289.99 with free shipping for a brand new unit. Daniel, Thanks for all the info. It is great following along on your trips. Glad to hear you will be home for Thanksgiving. Have a safe trip and a great holiday with the family, you have definitely earned it. Congrats PJ, thanks for all the great info and descriptions of how everything went. Keep us informed on your progress. I am heading to school in Missouri right after christmas, I have been doing all the CDL training on this site so I'm glad to hear it helps. I have been doing research on a lot of different companies, I will be going to Springfield Missouri at the end of December to start my training at Route 66 CDL and apprenticeship. I already have a pre-hire from Con-Way Truckload, Swift Transportation and US Xpress. Con-Way is my first choice for several reasons, they have great equipment, as a trainee you don't drive team with your trainer, the pay is better, it does cost more since Swift would pay for my training (I'm a vet) but working out the numbers over the first year I will make almost 10K more with Con-Way than Swift or US. I was a driver back in the 90's (started with Swift in 91) so I have an idea about what I'm getting myself into. Still have a lot to learn considering all the changes to the DOT and E logs...Brett I want to thank you for all the great CDL study materials. It is amazing how much I have forgotten in the last 20 years. I will continue with your online training and practice tests, hope to get through this without any hitches.